The Skinny: Yet another Japanese story of "pure love" between innocent youngsters, although this film features a decidedly different kind of romantic couple: step-siblings. The premise alone is more provocative and complex than that of most films of its kind, but unfortunately, the filmmakers behind Tears for You choose to adhere to genre conventions rather than actually deal with the reality of such an unconventional romance. Masami Nagasawa is clearly an actress on the rise, but this is not her best film. Masami Nagasawa, star of Crying Out Love in the Center of the World, returns to the "Pure Love" genre with Tears for You, a film inspired by Rimi Natsukawa's hit song Nada Sou Sou. 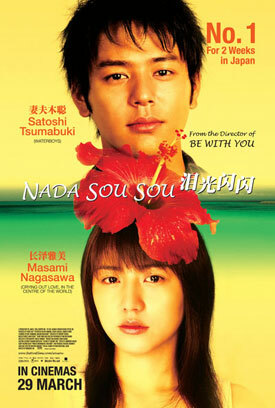 Directed by Nobuhiro Doi, Tears for You is a love story about two step-siblings, Yota (Satoshi Tsumabuki) and Kaoru (Nagasawa). Long ago, Yota's mother (Kyoko Koizumi) married Kaoru's jazz-playing father (Tatsuya Nakamura), effectively merging the two families. Unfortunately, Kaoru's father skipped town, and Yota's mother passed away, but not before imparting a dying wish to her young son to take care of Kaoru. In the meantime, the two young children were raised by Yota's grandmother on a small island off the coast of Okinawa. When Yota came of age, he took on a role not just as a brother but as a surrogate father of sorts for Kaoru, always working long hours on any number of jobs in order to support his sister's education. The film picks up with Kaoru moving in with Yota on Okinawa after some time apart, and from the first time he sees her, Yota is clearly smitten, although he keeps his feelings under wraps. Kaoru is excited to see him as well, although visibly troubled when she learns of Yota's med school girlfriend, Keiko (Kumiko Aso). Yota has hopes of opening a restaurant one day, and as fate would have it, a local businessman gives him an opportunity to realize his dreams. Unfortunately, things are not what they seem, and everything in Yota's life goes from bad to worse in terms of both his finances and his relationship with Keiko. His backbreaking work ethic in support of Kaoru's future becomes a bone of contention between the two step-siblings, as well as their emerging, clearly romantic feelings for one another. Love stories hinge on the chemistry between their two leads, and both Tsumabuki and Nagasawa do a serviceable job as would-be lovers, but both performances are somewhat problematic in execution. Although likeable enough, Tsumabuki doesn't seem to be able to handle the emotional scenes, as it always looks as if he's going to laugh even when he's breaking down in tears. Nagasawa - so good in Crying Out Love in the Center of the World and Touch - is so over-exuberant (perhaps intentionally so) in the initial parts of the film that she's more of a grating presence than an endearing one. However, Nagasawa's performance improves considerably as the more dramatic aspects of the plot kick into overdrive. The main problem with Tears for You is that in trying to adhere to the "Pure Love" aesthetic, the filmmakers completely gloss over the complications that could arise from a blossoming romantic relationship between these step-siblings by purposely avoiding the issue at any cost. To put it bluntly, the ending is a complete cop-out, as it completely sidesteps any sort of serious examination of the messy, complicated, but entirely sincere feelings between Yota and Kaoru by throwing in a typical tearjerker ending out of literally nowhere. On the bright side, this sad turn of events is almost salvaged by Kaoru's subsequent beachside chat with Yota's elderly grandmother, a scene that demonstrates Masami Nagasawa's more than capable acting chops. Unfortunately, however, there is a second ending, which is perhaps necessary in terms of narrative cohesion, but is so emotionally lacking considering the already heartbreaking content of the previous scene. It almost seems as if the filmmakers were aware of how unsatisfying this ending was, as they include a coda after the end credits as a way to perhaps hedge their bets.